International Journal of Research in Health Sciences,2015,3,1,93-98. 1-Assistant Professor, 2-Professor & HOD, 3-Associate Professor, 4-(MBBS), Dept of Community Medicine, Andhra Medical College, Visakhapatnam, Andhra Pradesh, INDIA. Research question: What are the various risk factors for hypertension in pregnancy and its effect on maternal and fetal outcome. The objectives were 1) To study the risk factors for hypertension in pregnancy, 2) To study the maternal and foetal out comes. 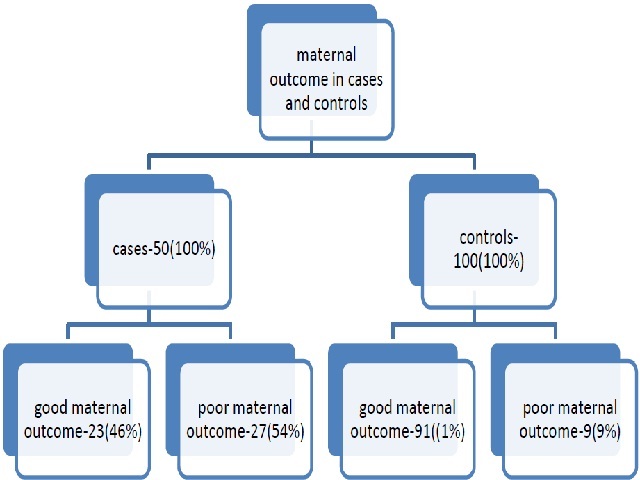 Methodology: A Case- Control study, was carried out in the Department of Obstetrics & Gynecology of a tertiary care hospital in Visakhapatnam city, A.P. Study subjects: One hundred and fifty antenatal women who have come for a safe institutional delivery were included as study subjects. Fifty women who fitted the definition for hypertension in pregnancy were selected as cases and 100 normotensive pregnant women were taken as controls. Informed consent was taken from the participants. Data on study variables was collected using a pretested, semistructured questionnaires and was analyzed using Microsoft Excel. Results: About 46% of the pregnant women in cases & 60 % in controls were in the age group 21-25years. Mean age of pregnant women among cases was 20.6 + 3.53 years. Majority (70% of the cases and 79% of the controls) were married between 15-20 years and more than 70% were housewives. About one fourth subjects in both the groups were illiterates. Body Mass Index (BMI) > 25 was observed in 22 % of the cases and 11 % of the controls. Factors such as overweight, being employed were significant risk factors. Intra Uterine Growth Retardation and preterm were found to be main fetal complications among cases as compared to controls. PIH leading to eclampsia is seen as common maternal complication. Conclusion: The study identified certain modifiable social determinants which have a role in primary prevention of pregnancy induced hypertension.